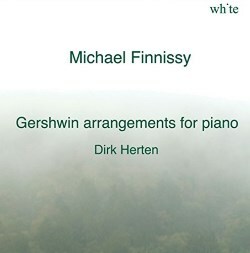 This recording by Belgian pianist Dirk Herten of Michael Finnissy’s Gershwin arrangements arrives like a demo CD in a simple card slipcase and carrying no further documentation. It is, however, well recorded, with plenty of detail and colour in the piano sound. As the title would lead you to expect, these pieces are lighter in character than many of Finnissy’s larger scale works, but the detail in their adaptation of famous standards into something new and original hides a significant compositional achievement. The Gershwin originals are more or less recognisable if you know them well enough, with Finnissy also throwing in some jazz-style gestures here and there to keep us grounded. The harmonies and rhythms of these familiar tunes have however been added to, stretched and altered to create a fascinating mixture of detailed richness and at times an almost Baroque framework of well integrated but elaborate additional material. There are a few alternative recordings of this set around. Nicholas Hodges’s recording on the Metronome label (see review) also includes More Gershwin and is pretty hard to beat. Ian Pace’s recording on the Metier label is also a strong candidate. This is recorded at a slightly more distant perspective than Herten and with more ambience of the ‘front-room’ kind. Ian Pace’s pedigree in performing Finnissy’s work is beyond criticism, and despite my impatience with The History of Photography in Sound (see review) I have nothing but admiration for his staggering stamina. Dirk Herten’s touch does however seem more keen to seek out the jazz ‘feel’ in these arrangements. Where Pace explores their more avant-garde side Herten sails closer to the Gershwin idiom, giving these arrangements at times a pleasantly improvisatory character – though perhaps more from a hotel bar than the concert hall. The problem with the cycle as a whole is the generally slow pace of the music, which perhaps makes it a bit much for one sitting. I waited for some discernible highlights, but the wash of exploratory meandering really refuses to let up, so that you end up with a musical meal something akin to Black Forest gâteau for starters, main and sweet. This has much to do with the performance, which is slickly polished but rather gentle when compared with Ian Pace’s more extreme and daring approach. Take Blah, blah, blah for instance, which Pace delivers at a fairly blistering 1:42 to Herten’s laid-back 3:43. This is an intriguing take on some fascinatingly far-out arrangements, but is by no means the last word on this subject.